When I was thirty-five, my wife and I were both reported dead by the first paramedics to arrive at the scene of a seventy-five-mile-an-hour hit-and-run. My wife Marcy died instantly that day. With brain damage from a massive stroke and my body broken, I wasn't expected to survive either." So begins Rise and Shine, the dramatic story of Simon Lewis and his remarkable recovery from a horrific car accident. Told through the eyes of someone who has lived through it" and successfully overcome the hurdles of the health insurance maze, Rise and Shine is a first-person account of unexpected tragedy and life-affirming courage, with lessons both medical and spiritual. Rise and Shine shows how much patients can achieve, beyond the limited horizons of insurance-based diagnosis, treatment and rehabilitation, to attain maximum regeneration and rebuild their lives. 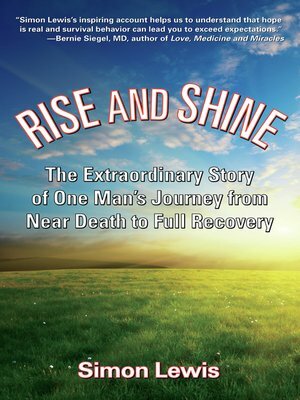 An inspiring story about what it means to return to life after a near-death experience, Rise and Shine is, essentially, an exploration of the nature of consciousness itself, and an impassioned tale about survival and recovery.